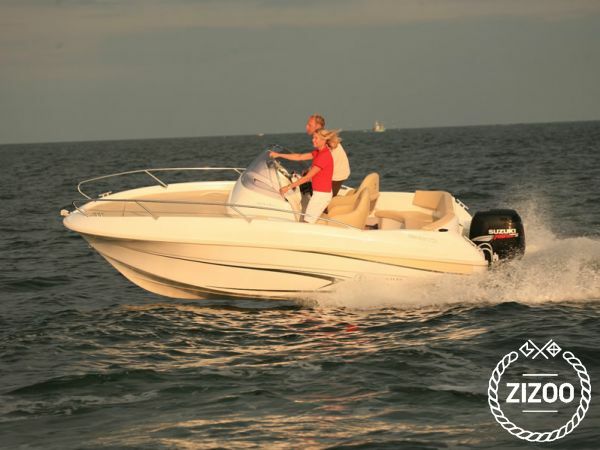 If you would like a day trip on a speedboat like this 2013 Beneteau Flyer 550 Sun Deck, but your group members are into different things, the perfect place to go is definitely Lubenice on the west side of Cres. It has one of the best beaches in the world, listed as number 8 out of 50, incredible blue caves to swim in, you can hike up to the old town of Lubenice just above at 378 meters, and the open sea is there for adrenalin lovers. Her 30 knot speed will get you there in a blink of an eye. She is equipped with a bimini, radio/cd player and upholstered seating, sun deck, and a fitted shower. There's nothing more you could wish for to make it a great day out. Pack your snacks and drinks, rent some equipment from your charter if necessary, pick her up from 9 am from Marina Losinj and head up through the Osor Channel, dating from the Roman times, to make it an adventure!